Tuesday, November 27, 2018 - Puddlecycle - Get Involved! Winter Wonderland Portland has one night each year where the huge holiday lights display surrounding Portland International Raceway is open to bicycles only. 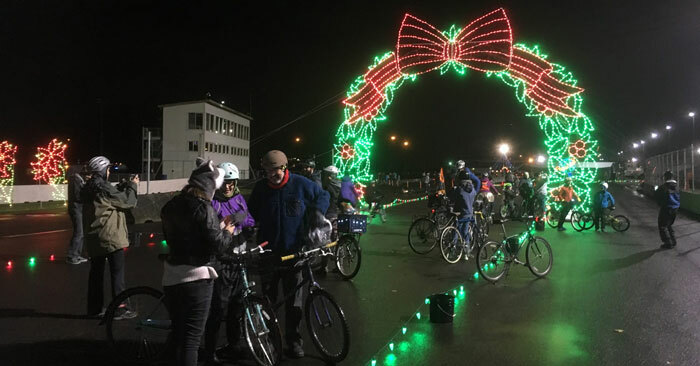 The 10th annual “Bike the Lights” is happening on November 27 this year, and this event page is for a 4-mile kid-friendly group bike ride to PIR. There will be an optional group ride back to the start point, and there is also a MAX station across the street from PIR to head South after riding “Bike the Lights.” Admission is $6.00 at Portland International Raceway (children under 13 are free). We meet at Dawson Park right next to the bikeway at 2926 N Williams. Holiday-decorated bikes are welcome on this ride and at Winter Wonderland! Meet: 6:00 pm at Dawson Park, 2926 N Williams Ave.